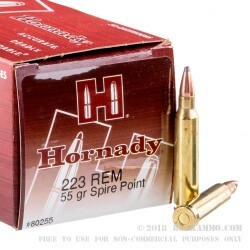 The Hornady line of 223 Remington Ammo is a well-known and highly regarded ammunition due to its capability, terminal effect, accuracy, and reliability in the field. For many years now, Hornady has designed, prototyped, and produced its own bullets in multiple configurations, as well as its own brass cases. 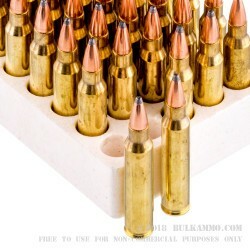 These Hornady 223 Remington 55 grain Soft Point (Spire Point) rounds are no different. 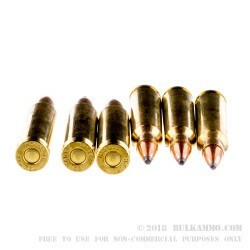 The feature the bullet mentioned above, loaded into a powdered and primed high polished, reloadable, Boxer primed, brass Hornady case. 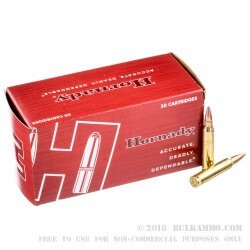 These rounds come packed up in the Hornady’s easily recognizable red 50 round boxes, in a case of 10 boxes, making a grand total of 500 accurate Hornady rounds. Get them now and these rounds will be on tap, ready for you to take to the range. Since 1949, J.W. Hornady saw the ammunition market differently than any other manufacturer at that point in history. He saw what the reloading market could become, and he built a thriving company around it, knowing what it would become. Today, Hornady has expanded we beyond their first .30 caliber 150 grain Spire Point bullet they started out selling.